September 27, 2018 By This post may contain affiliate links. Top individual servings of creamy and crunchy Bread Pudding with Chai Caramel Sauce to serve as a decadent breakfast or dessert. Enjoying some “me time” with a cup of chai tea and a delicious breakfast is one of the pleasures of getting out of bed in the morning. 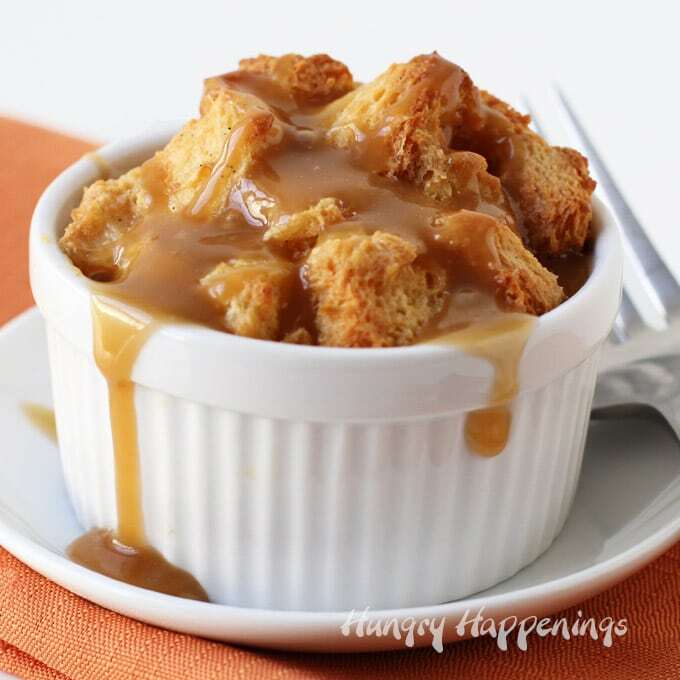 Ending your day with a cup of chai tea and a wonderful dessert can make even the worst day seem better; especially when breakfast or dessert consists of a homemade bread pudding that is infused with chai tea and topped with a gooey chai tea caramel sauce. It’s relatively easy to make bread pudding and you can get creative by adding various flavorings, mix-ins or toppings. I wanted to create a warm and inviting bread pudding that would be perfect for fall so I added some sweet and spicy Oregon Chai® Tea Latte Concentrate which combines black tea with cardamom, cinnamon, ginger, cloves, vanilla, and honey, to my custard. 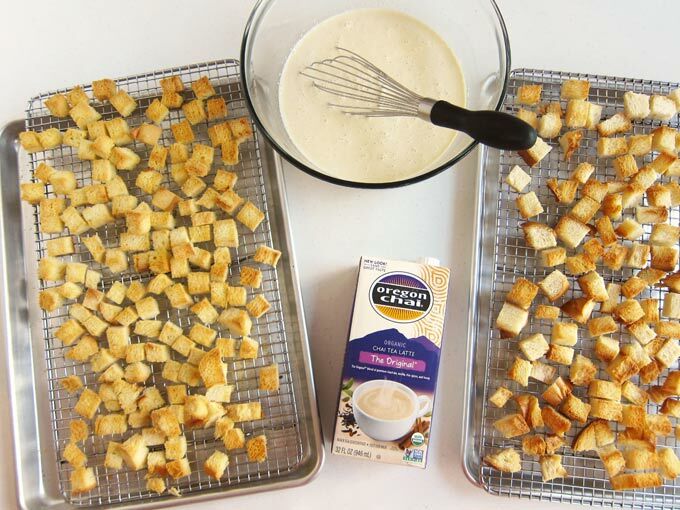 All of that flavor comes in one carton of Oregon Chai Tea Latte Concentrate which is typically used to make delicious drinks but can be used to enhance the flavor of so many desserts like Chai Apple Crisp and Pear Chai Thumbprints. Yum! I decided to really make this a decadent dessert so I used even more of the tea concentrate to make a caramel sauce to drizzle over the bread pudding and I’m so glad I did. Wow, the gooey sauce really makes this a dessert to savor. Traditional bread pudding combines a simple custard made with eggs and dairy (cream and milk) with cubes of bread. 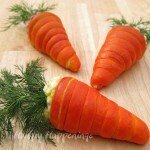 It is baked until golden brown on top and is soft and creamy inside. It is essentially a baked French toast casserole. Most bread pudding recipes are made with some sort of sugar and are sweet like this Chai Tea Bread Pudding, but you can also enjoy a savory bread pudding like the one I’ve made using Chicken, Artichoke, and Three Cheeses. It’s one of my favorite dinners to serve on a cool fall day. This bread pudding recipe is so easy to make but you want to start with the right ingredients. What kind of bread should I use to make bread pudding? Brioche is the classic bread used to make bread pudding or French toast. It is a butter and egg rich sandwich bread with a sweet flavor that will hold its shape after it has soaked up all the custard in this recipe. The bread on top of each of these individual bread pudding cups will be crispy and the inside soft and creamy. Challah works just as well as Brioche only it is a little less sweet. You’ll want to get a good quality sandwich bread, preferably a whole loaf you can slice into thick pieces. Sandwich bread can get a bit soggy if left sitting in the custard for too long, so if you use it for this recipe be sure to put the ramekins in the oven as soon as you get them filled. Skip the 30 minute rest. Use day old French bread to make this bread pudding. It will produce a lovely bread pudding with a chewier texture. You’ll want to cut the bread into 1 inch cubes then toast the cubes. You can leave the crust on or cut it off, just be sure you have enough bread cubes to create one layer on two 12 x 18 inch cookie sheets, approximately 18 ounces of bread. 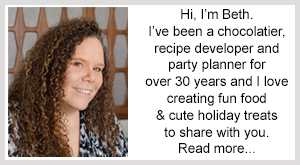 Do I need to toast the bread cubes when making bread pudding? Toasting the bread will ensure your bread pudding does not get soggy. The toasted bread will soak up the custard but will hold its shape once baked. Toast it in a 325 degree F oven for about 25 minutes until lightly golden brown and dry. Be sure to stir the bread cubes about half way through the baking cycle so that all the sides get toasty. Can I use day old or dry bread to make bread pudding? Absolutely. Bread pudding recipes were originally made to use up old (dry, but not moldy) bread. 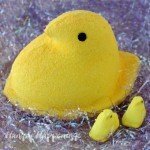 Should I use whole eggs or egg yolks to make bread pudding? Egg yolks make a richer tasting, velvety custard which will enhance any bread pudding recipe. If you add egg whites the bread pudding will have a sturdier consistency and an almost gelatin like texture. 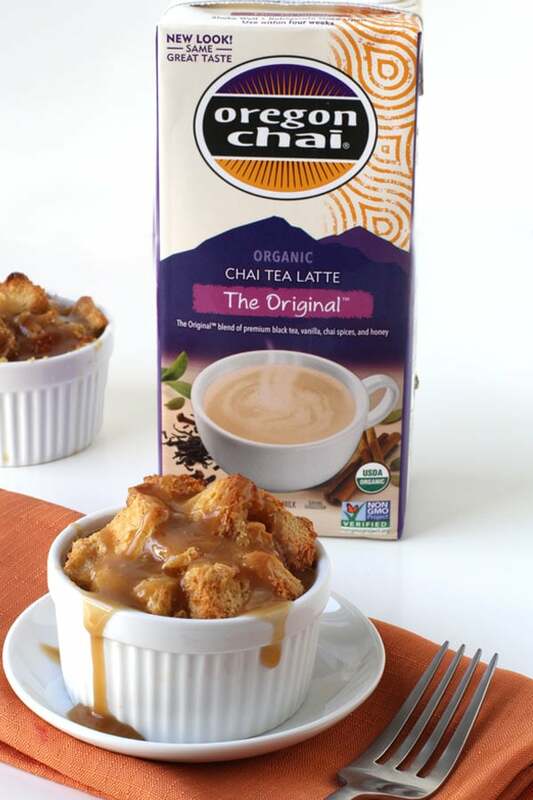 How can I get the flavor of Chai Tea infused in my bread pudding? 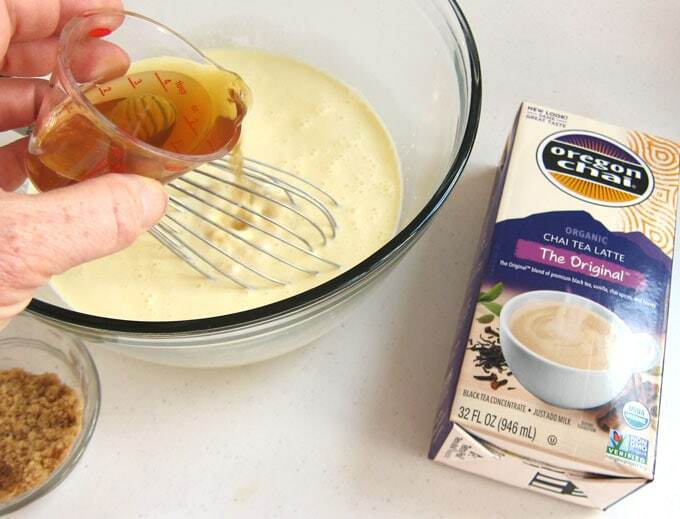 Add Oregon Chai Tea Latte Concentrate to your custard and to your caramel sauce. This will add a hint of black tea, cardamom, cinnamon, ginger, cloves, vanilla, and honey flavor to the bread pudding without any fuss. All that flavor comes in one carton of tea concentrate. This Oregon Chai product was inspired by the owner’s trip to the Himalayas. The flavor is truly authentic. Where can I find Oregon Chai Tea Latte Concentrate? At Walmart in the tea and coffee aisle. 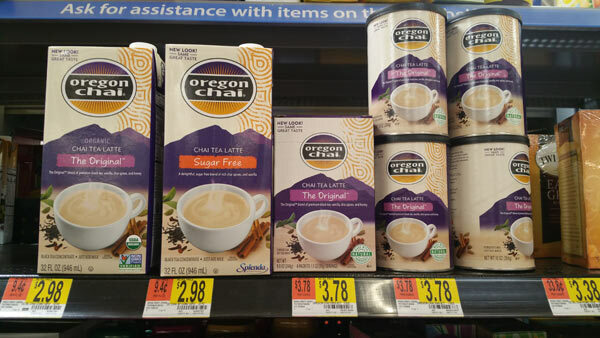 For a limited time (11/16/18-11/30/18 or until supplies last) you can save $1.00 off one Oregon Chai product using an Ibotta rebate found here. Yes. I like using vanilla bean paste because it isn’t watered down with alcohol and it has flecks of vanilla bean in a thick paste. It really imparts a lovely vanilla flavor in this bread pudding. If you use extract be sure to use pure vanilla extract for the best flavor. Why bake bread pudding in small individual size ramekins? Bread pudding can be made in one large casserole dish but the edges can become dry before the center is cooked through leaving you with a soggy middle. Baking the bread pudding in small bowls allows it to bake evenly so everyone can enjoy the crispy top and creamy insides. Plus the bread pudding will bake faster so you can enjoy this decadent dessert sooner! Decadently creamy bread pudding flavored with Oregon Chai Tea Latte served with a gooey Chai Tea Caramel Sauce over top. Grease a 8 small 6 - 8 ounce oven safe bowls or ramekins with butter. Set aside. Heat your oven to 325F. Cut bread into 1 inch cubes. 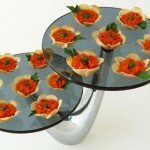 Arrange the bread in a single layer on 2 wire cooling racks set over rimmed baking sheets. Bake until dry and lightly golden for about 25 minutes, rotating pans and bread halfway through. Allow the bread cubes to cool completely for about 20 minutes. 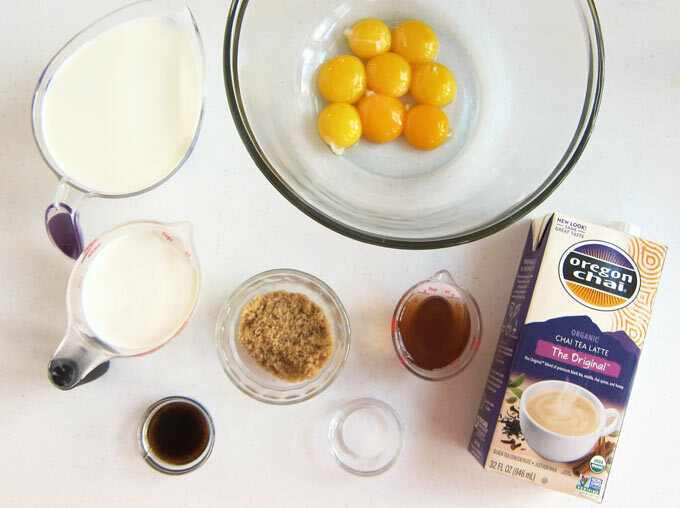 Whisk together the eggs, milk, heavy whipping cream, Oregon Chai Tea Latte Concentrate, brown sugar, vanilla bean paste, and salt in a large mixing bowl. Toss in the bread cubes and gently fold until well combined. Equally divide the bread among the 8 ramekins. Spoon any custard remaining in the bowl over each of the ramekins (approximately 1 tablespoon per). Place ramekins on a baking sheet and bake in the oven for about 35 minutes until the tops are deep golden brown. Whisk together the 1/4 cup Oregon Chai Tea Latte Concentrate, heavy whipping cream, brown sugar, and butter in a small saucepan. Heat over medium heat, stirring occasionally, until it comes to a boil. Boil for 5-6 minutes until the caramel thickens. 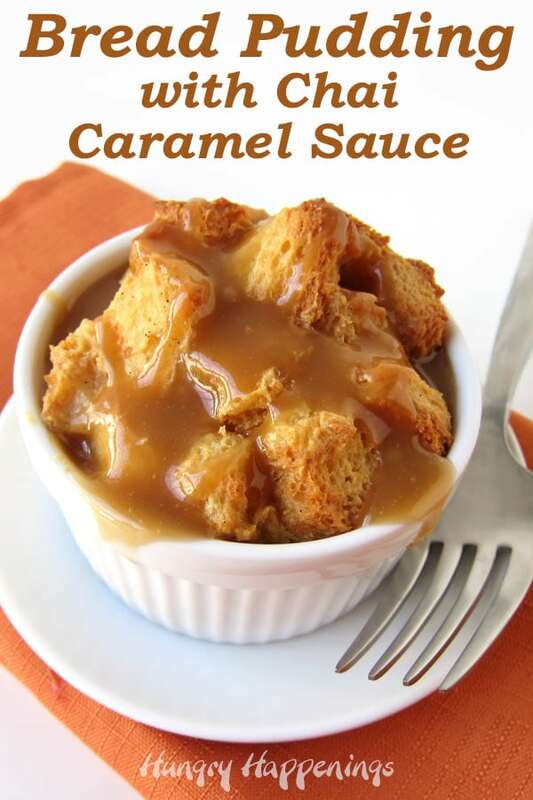 Remove bread pudding from oven, drizzle caramel sauce over top, and serve warm. If using Brioche or Challah Bread you can make this bread pudding and allow it to rest in the refrigerator for up to 12 hours before baking. 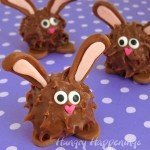 This is great if you are planning to serve this at a party. If needed you can rewarm the caramel sauce over low heat just before serving. These ramekins of bread pudding can be made up to 3 days in advance and kept in the refrigerator. 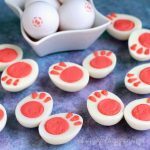 When you are ready to relax and enjoy a warm and cozy dessert or breakfast just pop them into a 300 degree F oven or toaster oven for about 15 minutes. While you are waiting you can make a glass of Oregon Chai Tea to enjoy with your sweet treat. That sauce is amazing! The flavors of the chai make this the perfect fall dessert! The sauce really does add a lot of flavor to this bread pudding! adding chai sounds amazing! I can’t wait to try this! This looks like a really tasty dessert. Love chai. 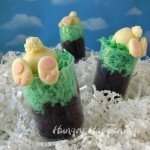 It is one of my new favorite dessert recipes. My family loves it too. I hope you give it a try.